Unaffordability is a major problem in cities of all kinds. Many households spend far more on housing and transportation than is considered affordable, and many people who would like to live in magnet cities cannot due to these costs. Cities are trying new strategies to improve housing and transportation affordability. However, it is important to be smart when evaluating potential solutions. Affordability can be assessed in various ways that lead to very different conclusions as to what solutions should be implemented. Measured one way, a solution may seem effective and beneficial, but measured in another, it may seem wasteful and harmful. The devil is in the details. The latest International Housing Affordability Survey is a case in point. The global report on housing costs helmed by three London School of Economics reporters and widely cited in the media, encourages urban expansion, thanks to what the authors perceive as higher affordability in urban fringes. My new report for the Victoria Transport Policy Institute concludes the survey deserves scrutiny, however, and that this important conclusion rests on a set of assumptions about economic opportunity, choice and happiness that can and should be challenged. “Affordability” refers to a consumer’s ability to purchase basic goods such as food, housing, transportation and health care. Extensive research considers how best to measure affordability. Since housing is usually a household’s largest expenditure, affordability was originally defined as households being able to spend up to 30 percent of their budgets on housing. But since households often make trade-offs between housing and transport costs – between cheaper urban-fringe housing or more expensive central-area housing, for example – many experts now define it as households spending no more than 45 percent of their budgets on housing and transport combined. The Survey evaluates housing affordability using “median multiple,” which measures the ratio of median house prices to median household incomes. This only considers house purchase prices, ignoring other shelter costs, such as maintenance, utilities and property taxes. Crucially, median multiple also ignores transportation costs. This is important since a cheap house is not truly affordable if located in an isolated area where getting to work or play takes more time and money than a more connected area. A household can rationally pay more than is generally considered affordable to live in an accessible neighborhood with lower transportation costs. These omissions bias the Survey results to exaggerate the affordability of urban fringe housing and the unaffordable of compact, infill housing in walkable urban neighborhoods compared with what households actually experience. As a result, the Survey ranks sprawled U.S. cities such as Atlanta and Houston as more affordable than Seattle and Washington, D.C. When evaluated using consumer expenditure data, the rank reverses. The sprawled regions’ lower housing costs are more than offset by their higher maintenance, utility and transport costs, making them the least affordable of the 22 regions for which data is available. Although Houston and Atlanta households spend relatively little on housing, this is offset by their high transport costs, making them the least affordable of all regions included in the U.S. Consumer Expenditure Survey. Source: U.S. Consumer Expenditure Survey. The Survey ignores many benefits of living in a walkable urban neighborhood. It claims that car-oriented sprawl reduces travel time costs, although people who live in more central neighborhood tend to have better access to jobs and shorter commutes than urban fringe residents. This is particularly true for non-drivers, who have far more independent mobility and therefore greater economic opportunities in central urban neighborhoods. The Survey also ignores the mobility needs of people who cannot, should not, or prefer not to drive, therefore also ignoring the isolation and higher transport costs they experience in car-dependent, urban-fringe areas. 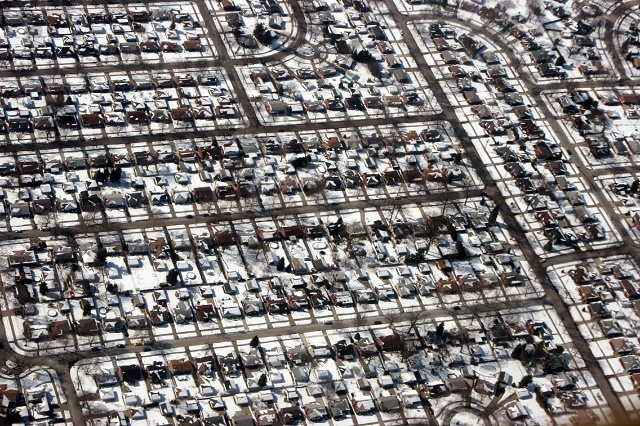 The Survey claims incorrectly that sprawl benefits disadvantaged people. Good research indicates the opposite: physically, economically and socially disadvantaged people have more independence, better economic opportunities and better outcomes in walkable urban neighborhoods than in car-dependent suburbia. Average commute times in Portland and Houston. Residents of more central urban neighborhoods tend to have much shorter commutes than at the urban fringe. Source: WNYC. Some urbanists call compact, multimodal development “smart growth,” which the International Housing Affordability Survey criticizes as consisting primarily of urban containment regulations. Smart growth actually includes a variety of strategies, many of which reduce regulations and increase affordability – for example, by allowing more housing types such as townhouses and apartments, reducing parking requirements, and promoting transportation options other than driving. The Survey claims with great certainty, but no real evidence, that “urban containment” policies are the primary cause of urban housing price increases. In fact, even studies it cites indicate that restrictions on urban infill (or redevelopment) are much more common and costly than urban expansion restrictions, and therefore a much larger cause of unaffordability in cities. Reducing urban infill constraints, so more households can find suitable housing in walkable, better connected neighborhoods, is the key to creating truly inclusive communities. Housing affordability is both a great challenge and a great opportunity. Housing affordability is both a great challenge and a great opportunity. With comprehensive affordability analysis and smart, integrated solutions we can create communities that truly provide economic opportunity, freedom and happiness. 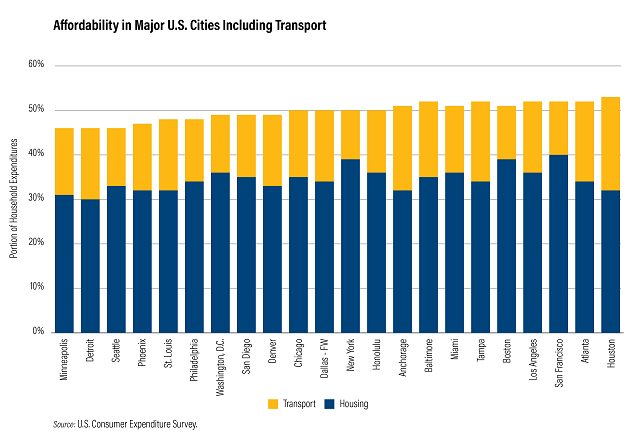 Tags: affordability, affordable housing, commute, D.C., housing, Houston, International Affordable Housing Survey, pedestrian, personal vehicles, Portland, public transport, Seattle, smart cities, sprawl, Todd Litman, walkability, Washington, D.C.